I guess that once we get old and start feeling more comfortable in our own skin what others think doesn’t matter much – what you feel or like or want should come first. I like to believe that. Back in high school it was all about being trendy and cool or, in other words, doing and saying what others did. I remember going to a concert with my friends a couple of times, it was a cover band that played Elvis Presley’s songs, but I never liked Elvis – I just pretended I liked it so I could fit in, since all the girls kept saying how great Elvis was (lucky for me the concerts were free). I was so bored one of the nights I started doing my Physics homework right there (the concerts were held on Friday evenings, and we would go right after school). Up until months ago I would tell everyone how awful whole wheat pasta was, and make faces when people brought the subject up. Then, while reading a recipe that called for that kind of pasta, it suddenly hit me: I was just replicating other people’s opinions. 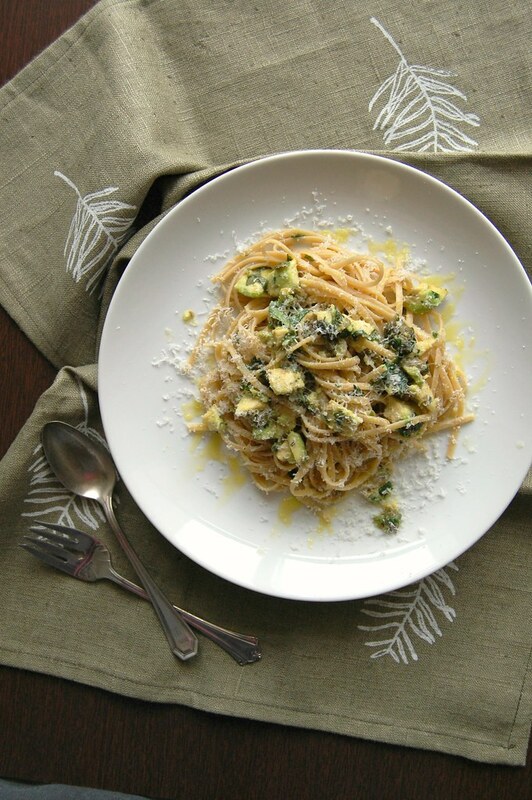 I had, indeed, had my share of bad whole wheat pasta dishes, but as someone who’s been cooking for as long as I have I should know better – I should know that maybe, and just maybe, there was something wrong with what I’d tasted. It could have been a case of bad pasta or bad recipe (or both). Things we do and say now and then, sometimes without putting much thought to them. I have been there, you probably have, too. We’re humans, we say stupid things sometimes, we follow wrong people. We make mistakes. Cook the linguine in a saucepan of boiling salted water until al dente (follow the instructions on the package). In the meantime make the sauce: heat the olive oil in a large nonstick frying pan on a medium heat, then add the capers and garlic and cook until fragrant. Add the lemon zest and the herbs, mix to combine and remove from the heat. Halve and destone the avocados, then use a knife to make criss-cross cuts through the flesh, chopping it inside the skin. Use a spoon to scoop out each half into the pan, and stir to mix all the flavors together. Before you drain the pasta, scoop out half a mugful of the pasta water. Drain the pasta, add it to the frying pan and return it to medium heat, tossing to combine. Drizzle with the lemon juice and extra-virgin olive oil, season with salt and pepper, and add a splash of the cooking water if necessary. Serve at once, sprinkled with the cheese. That looks delicious! Love the use of avocado. :) Pinned! What a great pasta, love the lemon and herbs!